We were tired of seeing our children glued to their TV and computer screens and trying to think of ways to motivate our children to get up and get active. We decided that if children could convert their activity into points that could be redeemed for free stuff they might get motivated to turn off the tube, get off the couch and get outside to play. In a perfect world their treadmills would power their TV’s and Computers but that’s a whole other story! Currently GeoPalz use 2-D pedometers that tracks users' steps throughout the day. The steps are then logged onto the GeoPalz website using a user name and password. At the end of each day a user logs their steps into the GeoPalz website and the steps are then converted into miles/points that can be redeemed for all sorts of physical prizes that will be shipped to your home as well as certificates that they can print and hang on their wall. Though both of our children are fairly active in the Summer months, they tend to become sedentary in the Fall and Winter Seasons. Aside from dance class and sports twice a week, they can generally be found indoors (neither enjoys or tolerates the cold temperatures very well...and snow? They will have absolutely NOTHING to do with it!). With the new school year upon us, and the inevitable shift in temperatures coming soon, I have been on the lookout for item's and activities that will help my children maintain a high level of activity in the coming months. GeoPalz are the perfect solution! 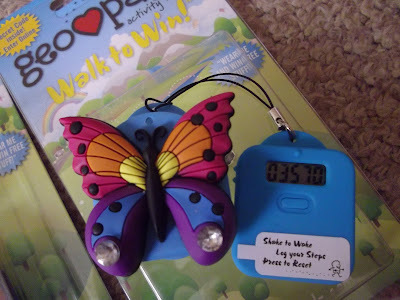 These adorable devices track children's steps (and easily clip on to the user's waistband) which add up to points that they can redeem for prizes (a great motivational tool to get them up and active!). Each device comes with a code on the back that you can use to create an account at http://www.geopalz.com/ . After creating the account, your child can then wear their GeoPalz each day, log their steps in their online account and earn points. Your children can then use their points towards prizes ( which include fun item's like GeoPalz branded merchandise, Target Gift Card's, Wii Points Gift Cards, amongst many others!). The princess received the gorgeous Butterfly GeoPalz (pictured above), and B received the Basketball GeoPalz (pictured above top). After opening them and giving them a full explanation of their purpose, Both of my children were clamoring to the computer so that we could set up their online accounts (the concept was an instant hit with both of them!). They each named their GeoPalz (another fun way to personalize GeoPalz and get the kids involved) and instantly got out and moving. As they raced out to the backyard they were discussing how they could achieve a large number of steps each day. After much consideration, they decided the best idea was to jump on the trampoline! They had a blast that first day using their GeoPalz, and have used them daily with equal enthusiasm! It's become a healthy competition in our home between our children, each of them wanting to "win" the better prize first. As a mother, I fully appreciate the reward system behind GeoPalz, it's a wonderful way to engage children and keep them motivated! I have a feeling that the sedentary months of Fall and Winter are a thing of the past in our home! 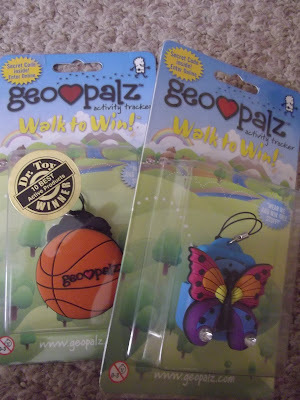 Keep the kid's active, and walk to win with GeoPalz! You can find GeoPalz online at http://geopalz.com/store/ or at a Whole Foods retailer near you.